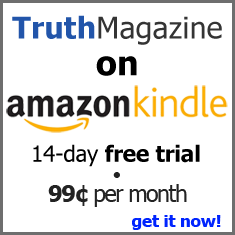 A reader of Guardian of Truth asked that we print an article answering the question of whether Christians (and their children) can celebrate Halloween by giving out candy, going "trick or treating," decorating or having a Halloween party. Brother Willis has asked that I answer the question. To understand why there would be a question about whether Christians can have anything to do with Halloween, let's look at the history of Halloween. The following quotes show the pagan and Catholic back-ground to Halloween. Now a children's holiday, Halloween was originally a Celtic festival for the dead, celebrated on the last day of the Celtic year, October 31. Elements of that festival were incorporated into the Christian holiday of All Hallows' Eve, the night pre-ceding All Saints' (Hallows') Day. Until recent times in some parts of Europe, it was believed that on this night witches and warlocks flew abroad; and huge bonfires were built to ward off these malevolent spirits. Children's pranks replaced witches' tricks in the 19th century, but most of the other Halloween customs are probably survivals from the Celtic festival (The New Grolier Multi-media Encyclopedia). Customs and superstitions gathered through the ages go into the celebration of Halloween, or All Hal-lows' Eve, on October 31, the Christian festival of All Saints. It has its origins, however, in the autumn festivals of earlier times. The ancient Druids had a three-day celebration at the beginning of November. They believed that on the last night of October spirits of the dead roamed abroad, and they lighted bon-fires to drive them away. In ancient Rome the festival of Pomona, goddess of fruits and gardens, occurred at about this time of year. It was an occasion of rejoicing associated with the harvest; and nuts and apples, as symbols of the winter store of fruit, were roasted before huge bonfires. But these agricultural and pastoral celebrations also had a sinister aspect, with ghosts and witches thought to be on the prowl. Even after November 1 became a Christian feast day honoring all saints, many people clung to the old pagan beliefs and customs that had grown up about Halloween. Some tried to foretell the future on that night by performing such rites as jumping over lighted candles. In the British Isles great bonfires blazed for the Celtic festival of Samhain. Laughing bands of guiders (young people disguised in grotesque masks) carved lanterns from turnips and carried them through the villages. In the United States children carved faces on hollowed-out pumpkins and put lighted candles inside to make jack-o'-lanterns. Halloween celebrations today reflect many of these early customs. Stores and homes display orange and black figures of witches, bats, black cats, and pumpkins. People dressed in fanciful outfits go to costume parties, where old-fashioned games like bobbing for apples in tubs of water may be a part of the festivities. Children put on costumes and masks and go from house to house "demanding" "trick or treat." The treat, usually candy, is generally given and the trick rarely played. Some parents feel this custom is dangerous. There have been numerous instances in which sharp objects or poisons have been found in candy bars and apples. To provide an alternative to begging for candy from strangers, many communities schedule special, supervised parties and events at Halloween. The United Nations has used the Halloween observance to collect money for its children's fund (Compton's Interactive Encyclopedia, 1993, 1994). In fact, it goes back to a practice of the ancient Druids in Britain, France, Germany, and the Celtic Countries, who lived hundreds of years before Christ was born. This celebration honored one of their deities, Samhain, Lord of the dead. Samhain called together all the wicked souls who had died within the past twelve months and had been condemned to inhabit the bodies of animals. The date for this celebration was the last day of October, the eve of the Celtic new year. It was a time of falling leaves and general seasonal decay, and it seemed appropriate to celebrate death. That's what it was  a celebration of death. It honored the god of the dead and the wicked spirits of the dead. The Druids believed that on this particular night the souls of the dead returned to their former homes to be entertained by the living. If acceptable food and shelter were not provided these evil spirits would cast spells, cause havoc and terror, and haunt and torment the living. They demanded to be placated. Look closely. Here is the beginning of "trick-or-treat." Evil spirits demanding a "treat." If they don't get it, you got a "trick." But how did all this become associated with Christianity? There's another part of the story that goes back to Rome. The Roman Pantheon was built by the Emperor Hadrian in about A.D. 100 as a temple to the goddess Cabal and various other Roman deities. It became a principal place of worship where Roman pagans prayed for their dead. Then, Rome was sacked, the barbarians came in and they took over the Pantheon, along with everything else. After several centuries it fell in disrepair. In A.D. 607 it was recaptured by the Emperor Faces and he turned it over as a gift to Pope Benefic IV. Benefic reconsecrated it to the Virgin Mary. This was part of a general policy that wherever pagan celebrations were well established, they would be continued and incorporated into Christian worship. (Only the names were changed to protect the innocent.) So, if you worshiped a certain god, and you were conquered and "Christianized," you could continue that same celebration. Only now you would offer it to one or another of the saints. No longer were Roman pagans gathering to pray to the goddess Cybele for their dead. Now the Roman Catholics were gathering to pray to the goddess Mary for their dead. And they did so in the same temples. For two centuries the major celebration in the Pantheon took place in May and was called "All Saints Day." Then in A.D. 834 it was deliberately moved to the first of November. Why? To coincide with those ancient Druidic and pagan practices that had been going on for centuries (John H. Howe, "How Happy Is Halloween? ", Christianity To-day, October 21, 1977). From these quotes we learn that Halloween, as we know it today, grew out of the merging of a pagan and Catholic celebration. That's what raises the question about whether Christians and their children can participate in Halloween activities. There are a lot of things associated with Halloween in which Christians cannot participate: (1) Abusive and mean activities toward children. There are always a few people who will put sharp objects, razor blades, drugs or poison in candy or apples. (2) Destruction of other's property. Detroit has its problems with "Devil's Night" on the eve of Halloween when fires are set over the city. Less destructive actions included eggs thrown at cars, paint sprayed on cars, stores and houses and pumpkins stolen and smashed in the streets. (3) Any celebration of death or pagan acts like those of the Druids. (4) Any celebration of "All Saints" (All Hallows') day by praying to the saints. Christians cannot have any part of these acts that are contrary to the word of God (by either being unkind to others or performing religious acts that are not authorized by God, cf. Matt. 7:12; Col. 3:17; 2 John. 9). 1. Just because the background and origin of Halloween is pagan and Catholic does not mean that it has that connection today with all who celebrate Halloween. There are many things that have a pagan or Catholic background that are not thought to be either pagan or Catholic in significance today. For example, "Christmas had its origin in a pre-Christian age among the pagans. It was adopted into the so-called Christian holidays by the Roman Catholic church. Even the name `Christmas' is of Catholic origin. Encyclopedia Americana tells us, `The name is derived from the medieval Christes Masse, the Mass of Christ(Ferrell Jenkins, "Christmas," Guardian of Truth, December 21, 1995, 756). Yet, Christmas today (as a civil holiday, not an observance of the birth of Christ) does not bear the significance of a pagan or Catholic back-ground. To enjoy time off work, being with family, eating a turkey, and exchanging gifts does not meanone is being pagan or Catholic. The same would be true of Halloween. Those who think that letting children "trick-or-treat" or have a Halloween party is being either pagan or Catholic would do well to consider the names of the days of the week and the names of the months of the year. Many of them have a pagan background. (Monday  Moon's day; Tuesday  Tiwes [Pagan god of war] day; Wednesday  Woden's [chief Teutonic god]; Thursday  Thor's [Norse god of thunder]; Friday  Freya's [Norse goddess of love and beauty] day; Saturday  Saturn's day; Sunday  Sun's day; January  from Janus [Roman god of gates or doorways]; March  from Mars [Roman god of war]; May  from Maia [a goddess, the eldest of the Pleiades]. Even our term "holiday," which we use to refer to New Years, President's day and July 4, comes from "holy day". How-ever, they have lost their Pagan or religious significance. 2. No Bible principle is violated by costume parties, children "trick-or-treating" or carving a pumpkin, etc. These activities do not honor the dead. Nor do they honor the saints. That is not to say that some would not make a connection between any observance of this day and the pagan and Catholic concepts. With Christmas many observe it as the birth of Christ. However, that does not mean that everyone who exchanges gifts or puts a wreath on their door is honoring Christmas as the birth of Christ. Likewise, some make Halloween a night of pagan activities. However, that doesn't mean that it bears that significance to all. If no Bible principle is violated, there is no sin involved (Rom. 4:15). Obviously, any who would violate his con-science by participating in any Halloween activity should abstain. To violate one's conscience is a sin (Rom. 14:23).